The Tula Cartridge Works was founded in 1880 and is currently one of the largest ammunition manufacturing plants in the world. The Tula name has gained a following worldwide for its rugged, reliable, and economical product. This cartridge complies with CIP requirements and the casing features a polymer-coated steel casing with a non-corrosive Berdan Primer. The projectile features a bimetal jacket (contains steel) and a lead core resulting in excellent ballistics characteristics. Please note that in mid-2015, Tula began using zinc-plated projectiles. 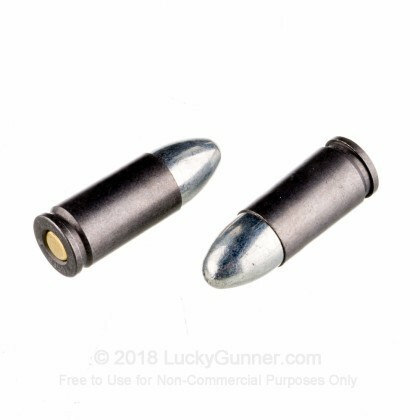 Although these projectiles may look strikingly different than the copper-plated bullets you're used to, rest assured that they will function and perform exactly like the Tula rounds you've always bought. Due to Tula's production and shipping schedules, we're unaware which type of projectile you can expect in your boxes. 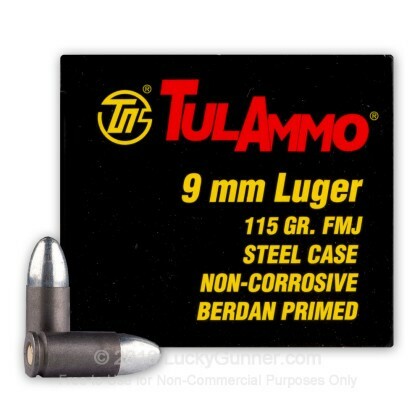 The Tula 9mm ammo works great in my Springfield 9 mm mod 2. the Tula 7.62X39 that I got from you works great also. Keep up the good work, I will order again!!! 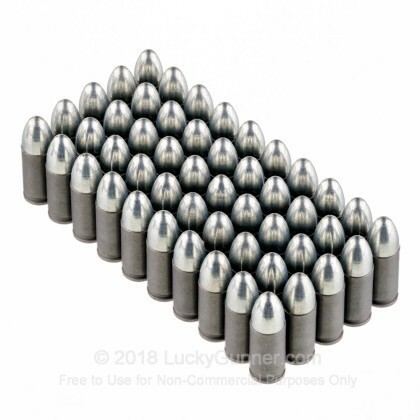 Good practice & range ammo. Did not have one misfire out of 500. It is a little dirtier than I'm use too. Makes me clean my weapon better. I would recommend this to anybody. I will purchase again. Good cheap fun. Great for practice. Thank you Lucky Gunner. This stuff just works. Its reliable and accurate. Its consistent. 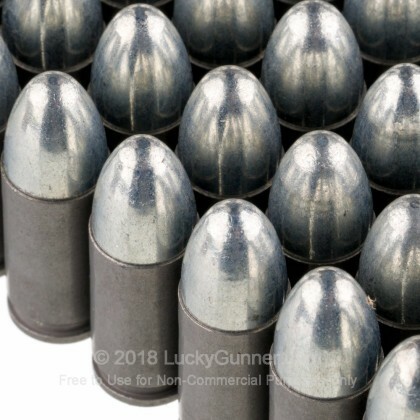 I used this ammo the first time I fired my new Glock 26. With this ammo I was able to familiarize myself with my new Glock with no issues. If it came to it I would feel comfortable using it as home defense ammo, I would buy again. A: Hi Sol! 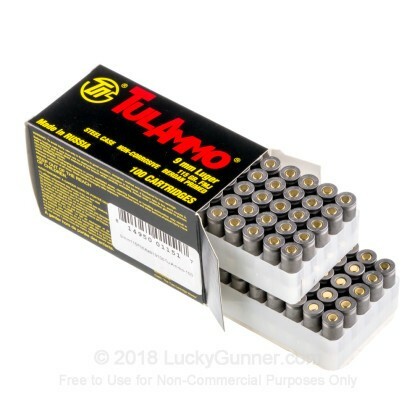 Tula's 9mm steel cased ammo works well with Glock 17's offering a great price point for your range training. Enjoy your range time! Q: Are these rounds indoor range approved? A: Hello Jason, This ammunition is loaded in a steel case with a bi-metal jacketed projectile. If your range requires ammunition to pass a magnet test, this round will not be able to be used. Due to the bi-metal jacket, the round does contain steel and will not pass a magnet test. A: Hello Albert, These 115gr. 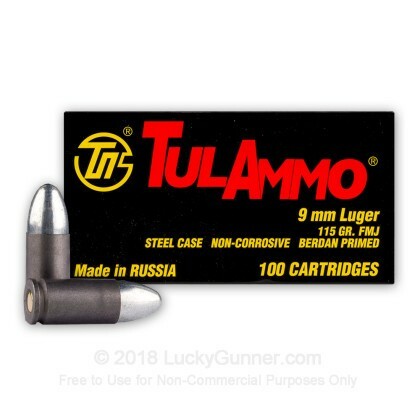 FMJ rounds by Tula in 9mm will work in any firearm chambered in 9mm (9x19). As long as your firearm is chambered in 9mm, then they will work for you.